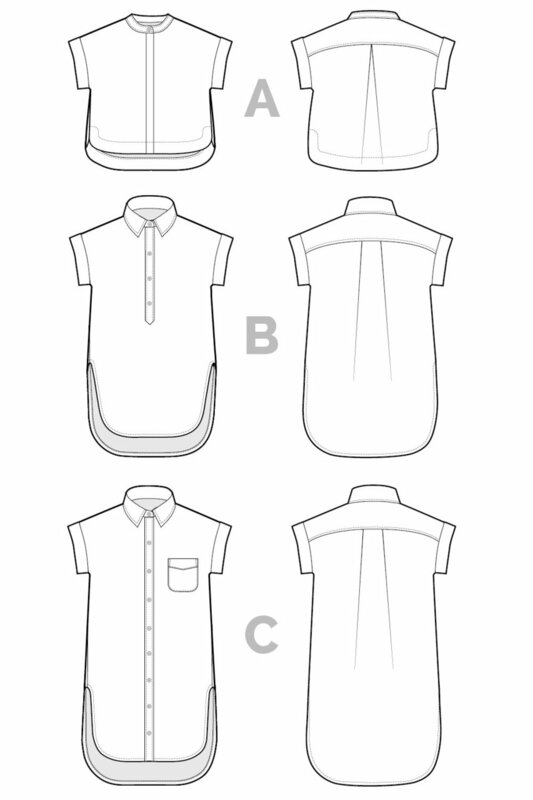 Have you tried any of the fabrics in the Pre-Cut and Kit buyout sections? I have been enjoying these for quite some time now, and have been amazed at the quality of the fabrics and the prices! 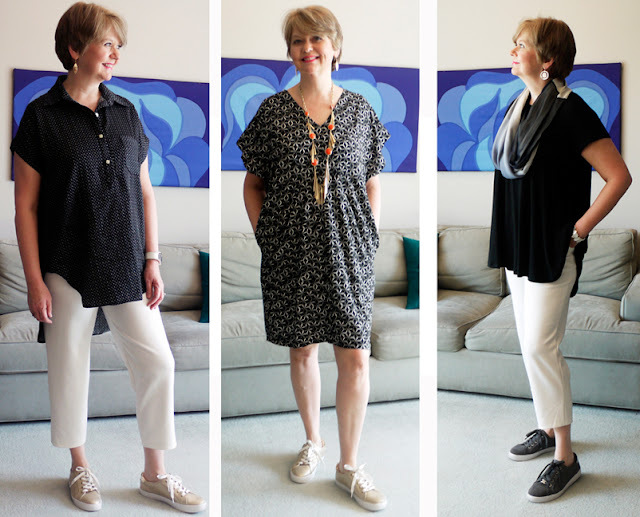 I wanted to make a black and white mini-capsule using some of the white and black pre-cut and kit fabrics that I've purchased, and was looking for some styles that were modern and easy to sew, when I came across Closet Case patterns. 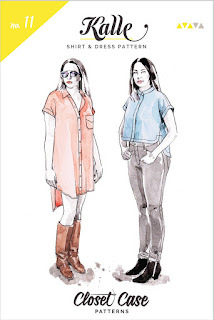 I'd heard of them before, mainly of their Ginger Jeans pattern, but since I'm not a jeans person, I hadn't looked any further. But, they also have some very cute tops and dresses, so I decided to give them a whirl! 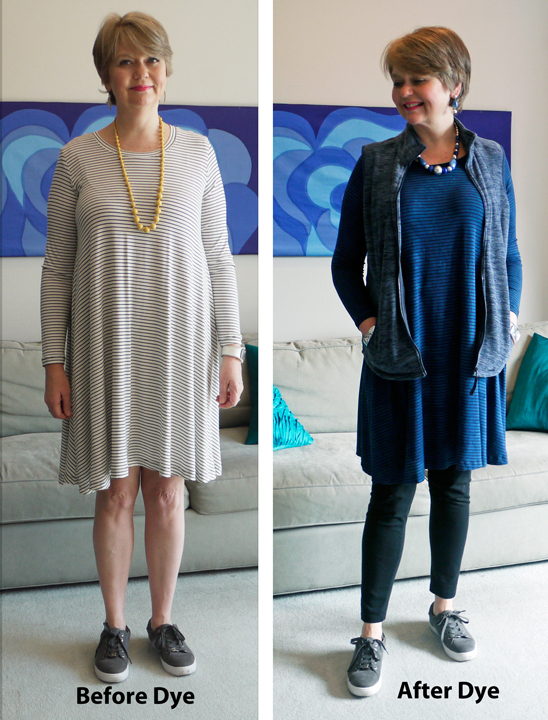 My first Closet Case pattern was the Ebony- this is a swingy knit top and dress pattern. The fabric is a solid black rayon lycra jersey that came in a kit, and is very drapey. 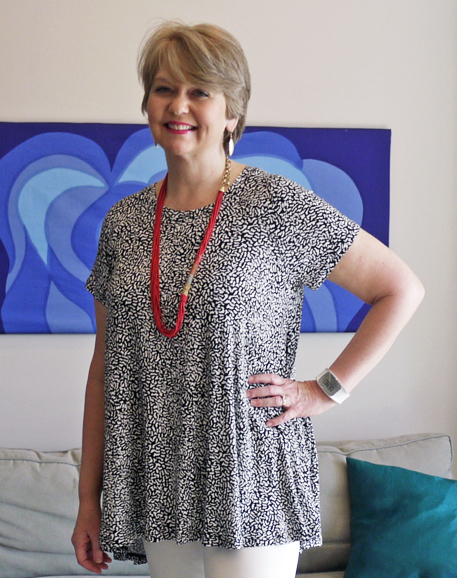 I liked it so much that I made a second out of a black and white printed rayon jersey. Really a super simple raglan sleeved design, that should look good on everyone! 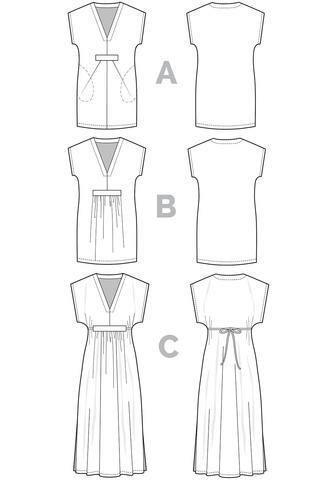 The hemline on all of the versions is a shorter in the front, and I made the difference a little less extreme in my top versions, as I wasn't quite sure how I'd like it. So, then I decided to try making the dress length version, in a white and black rayon jersey stripe from a kit. 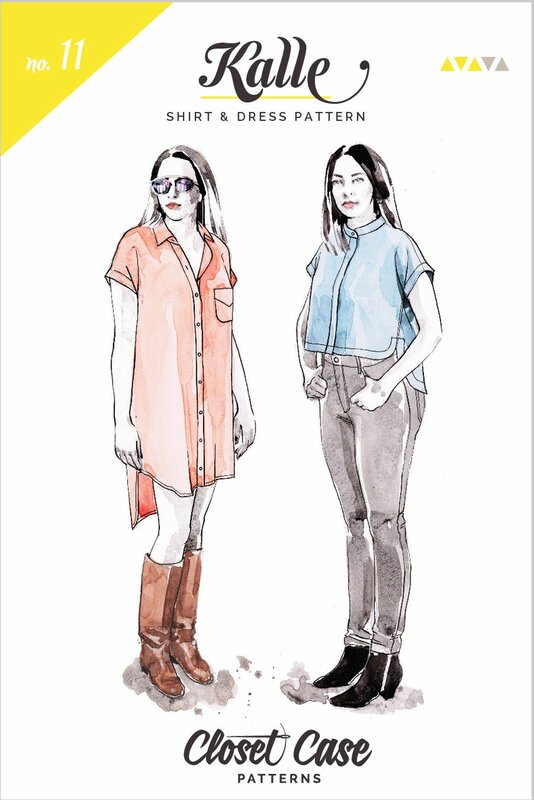 This is a completely different draft from the top because it has set in sleeves. Well, what can I say, it was not flattering, in the least. That's one nice thing about doing these blog posts, is that I can see pretty clearly in the photos when something isn't working. So, what to do? I thought about cutting it off to top length, but decided that part of the problem was the color. I threw it in a navy blue dye bath, and voila! Instantly loved it. I really enjoy dyeing fabrics. It's a great tool to have up your sleeve when projects aren't up to your expectations, so give it a try if you haven't yet! One thing to note here- all purpose polyester thread will not dye, unless you are using a dye specifically for synthetics. I had used all black topstitching thread, so it worked to dye the garment after construction, as the black was still appropriate with my color. But, if you have used a thread color for topstitching that doesn't coordinate with your dye color, this may not be the best idea! I don't think that the dress in this pattern is going to be everyone's cup of tea. I like it much better with the vest breaking up the large expanse of fabric. Plus, I need pockets, and sadly, this dress has none. 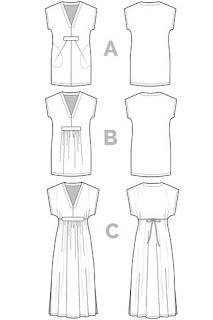 Of course, that is an easy remedy, and I could easily add some side seam pockets if I make it again. 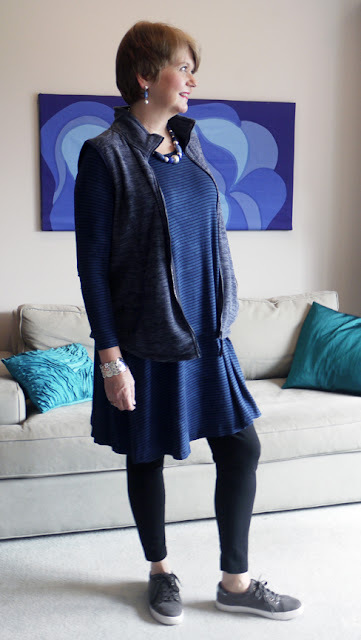 As far as the fit goes, I made the size 14, which I would take in ready to wear clothes, and I thought the fit in the bust, neck, sleeve and shoulder area was great. I also had ordered the Kalle pattern. 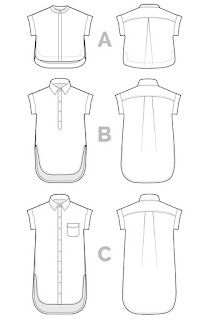 Kalle is a shirt and shirtdress made for woven fabrics. I decided to make the tunic length, View B, with a little extra length, out of a black cotton voile pre-cut with a tiny bird print. 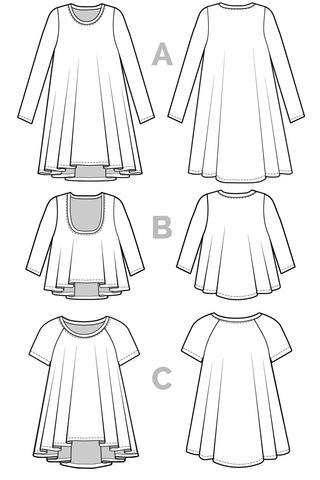 The instructions for the front placket are very clever, and in all of my years of sewing, I don't think that I've done one quite like it. I think that this one turned out really nice! And here it is from the back. I again made the 14 with no alterations, except for length because of my height, and I'm not sure that I even needed that- it's pretty long! But, the designer says that her patterns are designed for a height of 5 feet 6 inches, and I'm 3 inches above that, so I added 1-1/2". I always forget how much time woven shirts take to make. I think that I made ALL of the Ebonys in less time than it took to make one Kalle! But I did enjoy the process, and sometimes it's good to make yourself slow down and focus. And last, but not least, I tried the Charlie Caftan. This one has two lengths and two versions of the lower front. I decided to make View B, with the pleated front. My fabric was a black geometric rayon challis from a kit. 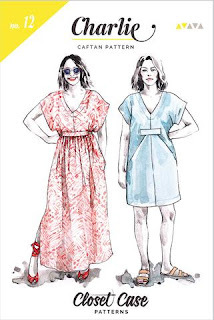 It was actually described as a cotton, and it had some sizing on it that made it feel more like cotton, but when I washed the sizing away, I could tell that it was definitely a rayon challis. This is a super comfortable dress, and I again, made no alterations to the pattern except for length. I can definitely see making this one again, as it is pretty simple and I like the modern vibe. I had enough scraps from the knit Ebonys to make one more top! The Ebony has one short top version, that is in the line drawings, view B. Even though I had already added a couple of inches to the length of View B, it was still much too short for me. So in a "make it work" moment, I flipped the direction of the stripes from another scrap piece, and made a little addition at the hem. I like this one a lot, and even though it's from the same white and black striped fabric that I ended up dyeing in the dress form, I think it works better here because there is the contrast neckband and sleeves to add in a little more color. So, I'm really impressed with the Closet Case patterns that I tried! They worked for me without as many alterations as I usually have to make for the more commercially available patterns, and that's a big plus in their favor. But even more than that, I like the wearability and modern feel that the styles have. I'm sure that I'll be using these patterns again! I love the precuts too and your mini wardrobe really showed why they are amazing purchases. I love everything you made and how it all works together! Love your makes! I recently bought several kits and am excited to get going on all of them. Thanks for sharing! Thank you! I've loved all of the fabrics I've gotten in the kits so far, so hopefully you will too! Really love how you made those pre-cuts work as a mini-wardrobe. Great job on all your items! Love the new additions to your wardrobe. Thanks for the tip about dying. Great save! I really like it in the blue and with your vest. Awesome, just awesome! Nice additions to any wardrobe for comfy staple pieces.